*A certain little boy that I've been bragging on a lot lately absolutely lost his chit toward the end of the week. Don't you love how our kids do this to us? On Thursday said child woke up mad and only got madder. He may have taken a red permanent marker and drawn all over the walls and on his brother's favorite pillow pet. He may have also kicked the neighbor and made her run home screaming. He may have also looked at me when he went to time out for the 300th time in a day and said, "So! I like it when you put me in time out! So there!" He may have been put in bed for the night at 6:45 pm for that little outburst. Somehow he survived to see another day and is slowly coming back to normal. 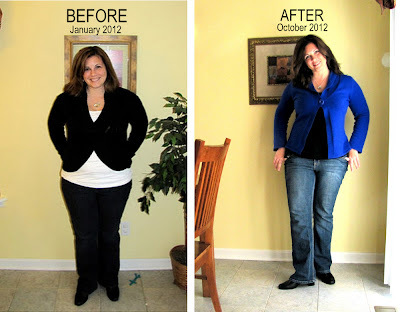 * I have lots of people ask me if I am still doing Nutrisystem. The answer is no. After nearly 17 weeks on it, I had to stop doing it over the summer. My stomach issues got so bad that I felt like I could barely eat anything and I'd thrown up so much NS, that none of it sounded good anymore. For over a year and a half, everything I was eating seemed to make me feel sick. Losing weight helped me feel better overall, but my innards still were killing me every time I put a bite in my body. I started seeing doctors in March trying to figure out what in the world was going on with my body and heard everything from "We think you have ovarian cancer" to "Your gall bladder seems to be dysfunctional." I had 4 scans, 3 ultrasounds, a colonoscopy and an endoscopy and everything checked out okay with the exception of inflammation in my stomach and intestines. FINALLY, a GI doctor said, I think you have a lactose intolerance, a gluten intolerance and IBS. IBS is TMI, I know. With her help, I radically changed my diet about 2 months ago and lo and behold, I don't go to bed in pain every single night. I didn't want to go gluten free. I kind of like gluten (ok, I LOVE gluten) I'm so sick of trendy gluten free people and I didn't want to be one of them. But I finally conceded that if it helped, I was ready to give up all the wheat and flour that I love so dearly. After two months without it, if I sneak a cracker or a bite of macaroni, I can literally lay down and watch my stomach blow up like a basketball. Anyway- I feel so much better. And I think that this whole thing agrees with me. Since January when I started with Nutrisystem and now doing no gluten and no dairy- I've lost 25 pounds. I get that lots of people can lose that in a month, but I'm slow and it took me 10! It's awkward to pose in front of the camera with no kids in front of me, but here's my before and after. (Actually, it's not fully an after because I'm still going) Also- I wear too many cardigan type sweaters. I need a style intervention! * Sadie is beginning a new business venture. She's making earrings out of string. She's planning on selling them for 30 cents a pair. I'm trying to explain profit margins to her to no avail. * Noah scored TWO goals this morning! * Earlier in the week, a political surveyor called and Kamron (for some crazy reason) actually took 25 minutes to answer all of her questions. At the end of the call, this is what I heard him saying. "We live in Simpsonville.... Simpsonville... SIMPSONVILLE.... Simp- son-ville.... No! Simpsonville!... Like Bart Simpson- plus ville... No- not BartSimpsonville! Seriously? Take off the Bart! Who lives in BartSimpsonville?!?" Oy vey. * Miles knocked his head on the bleachers at the park the other day. He couldn't stop crying and in an effort to calm him down Kamron started rubbing the back of Miles' head and said, "Wait a minute! Something's happening back here! Something's coming out of your head!" He secretly pulled a guitar pick out of his pocket and convinced Miles that he pulled it out of the back of his head. He quickly forgot that his head hurt and is now convinced that he produces guitar picks like a Pez Dispenser. Our whole family is in on the trick- even the grandparents- and we now constantly pull picks out of the back of his head and he thinks he's magic. I wonder how long we can keep this up? "Ta- da! Plastic comes out of my head!" * That's our lives in a nutshell this week! Have a great weekend!